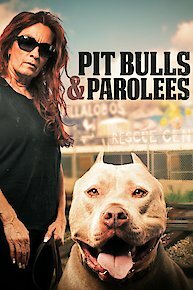 Pit Bulls and Parolees is a reality television show chronicling the day to day operations of the Villalobos Rescue Center, and the centers founder and owner, Tia Torres. While watching the show you will get to see some of the rescues, some of the adoptions, and you will also get to see the parolees hard at work cleaning kennels, feeding, watering, and walking the dogs. Villalobos meaning "house of wolves" in Spanish, began as a wolf rescue in the early nine-teen nineties. It is now the country's largest pit bull rescue center. Tia, along with her daughters, Mariah and Tania, her sons, Kanani and Keli'i, and the half dozen parolees employed at Villalobos, take care of over two hundred Pit Bulls that are currently at Villalobos. Villalobos rehabilitates and retrains all of the Pit Bulls that they rescue, and hope that one day they will all be adopted into their forever homes. The rescue center cost about a thousand dollars a day to operate. They depend on the fees from the adoptions of the Pit Bulls, and the donations that they receive to keep up the day to day operations of the center. Villalobos has recently relocated from California to New Orleans and also has a center in New Mexico. The center in New Mexico is run by a former parolee, Mando. This center is for the lifers. Lifers are the Pit Bulls that Villalobos rescues that can not ever be adopted due to court orders, or just because of certain behavior issues. The New Mexico center is not currently open for operations, however the New Orleans location is up and running in full swing. Pit Bulls and Parolees gives the world a better understanding of what it takes day to day to run a successful animal rescue center, and gives the world a better understanding of the Pit Bull breed. Tia Torres is also giving a second chance to the parolees that she employs, who might not find employment anywhere else because of the crimes that they have committed. Lizzy and Elise struggle to rescue a dehydrated dog in the blazing heat. An anxious, abandoned dog is moved to a new warehouse for dogs with special needs. And, Tia and the twins help a friend of the rescue find the perfect match. Tia and her kids race to rescue a stray dog near a dangerous busy highway. Tia and Country Matt team up to rescue a reportedly aggressive dog. When a local student wants to adopt a dog that can join her on runs, Earl joins in the training regimen. And, parolee Jammall oversees the care of a dog with serious health issues. A potential best friend needs to pass a unique test before he can be adopted out. Parolee Jammall returns after a mysterious absence. A year after losing their house in a fire, M2 and Kanani do something special for the dog who saved their lives. A potential adopter wants to give a forever home to a senior dog that has only known life in a kennel; M2 and Kanani are shocked when they find a box of puppies in a field; and Matt and Earl head to the kitchen to cook up some fresh food for a sick dog. A VRC senior dog finally gets the chance to have a forever home when a couple from Idaho comes to New Orleans to find a new family member. Mariah faces a challenging rescue when she realizes the dog in danger is deaf. Former adopters come back to Villalobos set on adopting a special needs dog. When a woman calls Tia to surrender puppies she can't care for anymore, Tia is shocked by what she finds; months after their house was destroyed in a fire, M2 and Kanani prepare to move into their new home. Tia gets a call about dogs that have been abandoned in Villalobos, but when Tia and her team arrive on the scene, it's one of the worst cases of neglect that she has ever seen. Former adopters return to VRC to find their dog a companion; Tia and Lizzy switch up their usual adoption procedure to get the best results; and Marcel rescues a dog abandoned at a local church and is concerned that some masses could be cancer. A disabled veteran and his wife come to Villalobos to find two dogs to help with his depression. Marcel and Mariah race to help a puppy in need. Former adopters want to expand their family and adopt Caleb, a puppy that Tania rescued at birth, but Tia is unsure he will fit in with their other dog. Also: when a local gets arrested, his dog is left behind and VRC is called in to help. A family from Chicago comes to VRC hoping to find their first dog; in Assumption Parish, Tia takes in a dog that has been attacked and is near death; and Earl bonds with a young Villalobos employee and tries to mentor him on how to stay out of trouble. The police need Villalobos' help when a woman in the French Quarter is rushed to the hospital, leaving her dogs behind; a recent divorcé from Alabama visits the rescue to help fill the void in his home; a favorite dog, Rhino, faces a health crisis. Country Matt returns to help his brother, a new parolee, overcome his fear of dogs. Villalobos is tested like never before when Tia and her crew are called upon to rescue a pack of wolf-dog hybrids, abandoned by a backyard breeder. With law enforcement threatening to kill the dogs, Tia and the VRC team are under pressure to find and rescue all the dogs on the sprawling property. Pit Bulls and Parolees is currently available to watch free on Animal Planet and stream on Animal Planet. You can also stream, download, buy, rent Pit Bulls and Parolees on demand at Amazon, Vudu, FandangoNow, Google Play, DIRECTV NOW, iTunes online.